In 2012, the Presbyterian Church (USA) reframed New Church Development to New Worshiping Communities at the National New Church Development conference in St. Petersburg Beach, Florida, during the Mid Council Strategies track to discern how to start new worshiping communities. Consequently, a church wide movement was formed stirring God’s people to do new things. God’s Spirit is moving to reach out to new people, and is sparking new energy by transforming communities. The PC (USA)’ 1001 New Worshiping Communities has expanded what was New Church Development to broaden involvement in starting new worshiping communities with leaders who want do missional work in new forms. As the Pastor for Church Development and Multiracial Ministries, I have been commissioned by the Presbytery to come alongside Racial Ethnic entrepreneurial leaders who feel called to start new worshiping communities not only church planting, but also new exploring church growth. For example, Racial Ethnic Ministries at Denver Presbytery is moving forward with work on strategies of sustainability in leadership and finances. We have learned that each ministry has its own DNA and ways to develop. We have been blessed with committed bi-vocational Presbyterian leaders starting new worshiping communities in creative ways. We have also been blessed with several churches and sessions that have joined the journey to come along as partners with new worshiping communities and leaders committed to follow God’s call. The Presbytery of Denver celebrates the ministry of the following new worshiping communities: Divino Salvador in Aurora, Rev. 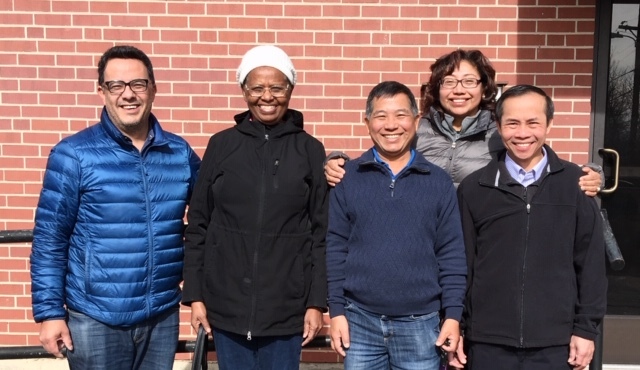 Lemuel Velasco; Myanmar Christian Community in Englewood, Pastor Andrew Thang; Neema African Fellowship in Aurora, Rev, Jemimah Ngatia; The Vietnamese Presbyterian Fellowship in Denver at Bethel, Pastor Tu Duc Bui; Northwest Denver Missional Community at homes, Rev. Joel Adams; Pree ‘n Pree Worshiping Community in Denver at Central, Rev. Tim Mooney; Wild Village New Worshiping community in Denver, Rev. Dan Dolquist. As Presbyterians we have a lot to learn, but one thing we cannot underestimate is our witness to the Gospel by sharing the Good News of Jesus Christ. Church growth can only happens when we invite others to come along.Church growth really happens when we make space at the table for others.I want to extend an invitation to have coffee with me to anyone who feels called to explore the possibility of starting a new worshiping community initiative. The Presbyterian Church (USA) has Seed Grants available and the Presbytery of Denver will match those grants. You can reach me at the Presbytery center.